An enterprise challenge at Plymouth University saw students apply their accounting skills to set up a ‘new zoo exhibit’. Students from BA (Hons) Accounting and Finance were challenged to create a hypothetical new exhibit for local attraction Dartmoor Zoo, choosing from a list of eight animals, which could be housed on one of four sites within the park. The teams had a budget of £20,000, and they had to consider the animal’s requirements, costs and ratings in terms of public appeal, educational value, conservation value and ease of keeping. They also had to complete costings – such as fencing, housing and enrichment activities – as well as ensuring that their chosen animal met the zoo’s stated aims of promoting conservation and education. To add a real sense of enterprise, the students were also given the zoo’s income and expenditure for 2014/15 and they had to show that the new exhibit would increase the zoo’s surplus in the future. To finish the four-week-long challenge, the students had to display posters explaining their reasons for making their decisions and give a short presentation to a panel of the senior management team from Dartmoor Zoo. 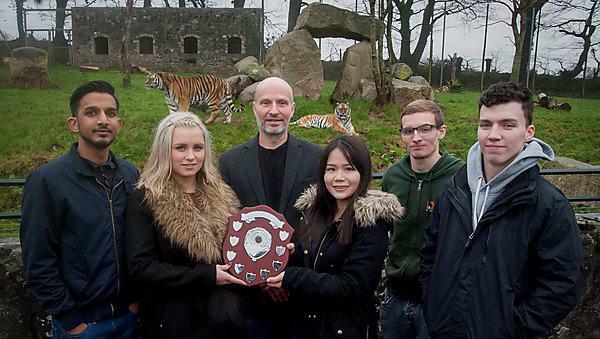 Director of the zoo Benjamin Mee, who received an Honorary Doctorate of Science from the University in 2013, presented the winning team of Alex Downes, Grace Ting, Muhammad Miah, Victoria Maggs and Chloe Sage with the Enterprise Shield. The University of Plymouth helped me develop academically, professionally and personally, leading me into a job with which I am delighted… The support from the business school was outstanding and I believe that I would not have landed my job without them. Now working for Red Bull, Joe recognises the importance of his time spent at Plymouth and in his year in industry. For more information about studying accounting and finance please visit our BA (Hons) Accounting and Finance page. For more information about our range of courses within the Plymouth Business School, please visit the school page.